Had I known it was Haile's (record), I would have tried a little bit harder. He's obviously the greatest distance runner of all time... It's one record I'll be proud to have." *LRC: 2008 Reebok Boston Games LetsRun.com Recap: Defar and Dibaba Restore Order in Boston The fans in Boston have been spoiled the past few years at the Reebok Boston Games and it looked like they might go home disappointed until Meseret Defar (& Kim Smith) and Craig Mottram put on a show in the nights two final events. Defar smashed drug cheat Reginald Jacobs' 2 mile world record and Craig Mottram took down Haile G's 3000m All Comers record. We break down all the action with quotes, photos and more. *USATF Preview of Reebok Boston Indoor Games Worlds top 3 in shot put, WR attempts by Dibaba and Defar (which actually pisses us off as one is in the 3k and the other in the 2 mile), Khadevis Robinson vs Nick Symmonds, Mottram vs Willis and Cragg at 3k, and the return of Jen Toomey. More: Nick Willis Has Lost Weight and Is Ready for Reebok Boston Games He's lighter than when he was 18. *Wednesday's "Spirit of Marathon" Movie Premier Getting Good Reviews It was a good movie done very professionally with great music. The movie will show one other time in Feb.
*Ever been nearly killed while running? Cars, a guy reportedly escaping from John Wayne Gacy, and a guy getting hit by a 40mph car and not breaking a bone. 2007 Champs Robert Cheruiyot and Lidiya Grigoryeva to Defend Boston Titles This Year Cheruiyot is a star of the sport and his rags to riches story is incredible. Hopefully, Chicago champ Ivuti will also toe the line. Next Weekend: Great Women's Pole Vault at 2008 Millrose, Rupp, Willis Join Mile Field vs Mottram and Lagat Not sure what Rupp is thinking as he'll have his hands full with Lagat, Mottram and Willis, but it should be a fun time in NY if he can just enjoy the atmosphere. Sad News: Wesley Ngetich, 2 Time Grandma's Marathon Champ, Killed by Arrow in Kenyan Violence He was also runner-up in Houston and had hoped to run Rock N Roll Arizona last week but the violence in Kenya kept him from leaving. If he had successfully defended his title in Grandma's this year he would have been the first three time winner. Seville XC World 5k Bronze Medallist Moses Kipsiro Edges Reigning World XC Champ Zersenay Tadese In Epic Duel The two threw the hammer down and put on a show for the fans. It came down to a near photo finish. In the women's race, the Osaka 5k bronze medallist, Priscah Jepleting, also got the win. Gebrselassie Hoping for Negative Split, World Record and $1,250,000 in DubaiThe great one knows that the negative split is the way to go. He's looking to feel good at 30k after an opening 62:15 1st half. IAAF Article Says Haile Is Very Relaxed His main challenger is expected to be the 3rd fastest man ever, Sammy Korir, who is healthy once again. Carmen Douma Hussar, Jen Rhines and Sara Hall Squaring Off at New Balance Mile This Weekend in NY Douma Hussar will be looking for her 2nd victory in 6 attempts on Saturday but the favorite on paper may be former world indoor 3k record holder Liliya Shobukhova. Jen Rhines, age 34, seems to be continuing her succesful move down in distance as she gets older. In the men's race, Alan Webb will not defend his crown in the race whre he first went sub-4. LetsRun.com: Olympic Trials/NYC Television Ratings The men's Olympic Trials were a great success in terms of performance but how did they do in terms of television ratings? We break down the numbers. It was a big week on and off the track. 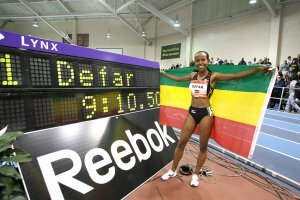 Masback going, going gone; Bekele over Tadese; Ritzenhein, Carney and Hudson; the emergence of the "next Paula Radcliffe"; Marion Jones goes to the slammer; our solution for world peace; Rock N Roll gets sold; and much more. Scotland's David Jenkins, Olympic 4*400 Silver Medallist, Went to Jail for Smuggling Millions of $ in Steroids, Now He's a Multimillionaire He peddles supplements such as one like a Snickers on steroids. Edingburgh: Bekele Defeats Tadese, Gelete Burka Wins Womens in Edingburgh Bekele pulled away on the final climb and the Amercians Dathan Ritzenhein and Jorge Torres did well. Ritz stayed close to the leaders until the final lap, and finished 14 seconds back in what Bekele said was a "very fast race" and Torres was 18 seconds behind Ritz. Craig Masback Steps Down As CEO Of USATF To Take Job At Nike Ten years after taking over, Masback has decided its time to move on to a new challenge. He leaves USATF in a significantly better financial situation than when he started as he took over an organization that was near bankruptcy and almost $3.5 million in the hole. Now USATF has almost $3.5 million in the bank. Masback's departure for Nike is going to raise questions in regards to USATF awarding the 2012 Olympic Trials to Eugene before the 2008 Trials have taken place. That aside, the fact Nike hired Masback is perhaps the best testament Masback could get of his tenure at USATF. *Vin Lananna Talks About Craig Masback Leaving and It's Impact on the Olympic Trials (video) He says Craig has done a "marvelous" job. And kudos to runnerspace for asking Vin about the Nike relationship. LetsRun.com Editorial: Ryan Hall's Making The Correct Choice In Deciding To Run In 2008 Flora London Marathon We support Ryan's decision and upset sports fans in Boston by asking the Boston Marathon to get with the times. Boston fans will be even more upset when the Patriots lose in the playoffs. Ryan Hall (and Samuel Wanjiru) Running 2008 London Marathon This is big new. Hall is perfectly suited for the marathon and we're glad to see him facing the world's best again. This also confirms a lot of people's belief that the Olympic Marathon Trials don't have to be in the fall. Oh yeah and in case you didn't know the London field is sick. Top marathoner in the world Martin Lel, World Champ Luke Kibet, Paul Tergat, Moroccans Abderrahim Goumri and Jaouad Gharib, Olympic champ Stefano Baldini and Meb Keflezighi, and now the top 2 young marathoners in the world in Wanjiru and Hall. Boston seems like it has to get Cheruiyot or it won't have ANY of the top guys in the world. Maybe hosting the Women's Trials and not having a title sponsor is making it cut back on its other races. Univ. Of Arkansas Appealing Its NCAA Sanctions For Track & Field: The university says the punishments they received related to Tyson Gay were 'excessive and inappropriate'. We sort of agree as he had a pre-existing relationship with Brauman and only received $376 worth of recruiting benefits - 9 months after he already has committed to UArk. Haile G to Run Lisbon Half and Course Will Be Altered to Make it a Record Eligible Course This is our kind of race. Osaka Marathon: Kayoko Fukushi Set for Marathon Debut This race is an Olympic qualifier in Japan and the debut of Japanese record holder at 5k and the half marathon Fukushi. If she runs well, she could be a big threat in Beijing. Drug News: *Justin Gatlin Says He Will Fight Drug Ban Because He Doesn't Want His Kids to Get Made Fun of at School Unfortunately for Justin, nearly all drug cheats claim to be innocent and he was coached by Trevor Graham, so we don't think a lot of people buy his claims of innocence. *Michael Johnson Says Sport Will Never Be Drug Free and People are Shocked He says it is like "expecting a society completely free of crime"and he is right. Viewer input wanted for corrections/omissions. Maria Mutola to Retire After End of This Year After 17 Years at Top of Sport Her resume is truly incredible. Hopefully she wins at Prefontaine again this year. She has won Pre 15 straight years. Rule #1 for Most People: Don't Do Ultras, Rule #2 Especially Don't Do Them if It Is Below 0: Andrew Wells to Lose 2 Toes after Running Ultra Marathon in the Cold He "won" the race as everyone dropped out before him. Results of USA vs World Meet in Fresno Some races had just 3 people in them. Gatorade Names Ashley Brasovan Cross Country Runner of the Year This should be pretty simple. You win Footlocker you're runner of the year. Instead Gatorade managed to screw it up on the boys' side. LetsRun.com! The Week That Was We recap the last week in the running world Marathoning came into the 21st century with the $250,000 first prize in Dubai, Geb went for a cool extra $1 million, Mexican corruption ended Ana Guevara's career, the IAAF kicked Oscar Pristorius to the curb, Tyson Gay got honored by the USOC and much more. Good Reads: *Ryan Hall and His Coach Terrence Mahon Talk About London This is all you need to know about Hall's talent. "Lel's finish is proving to be phenomenal, but we can see some weak points in his overall game", says his coach Terrence Mahon. Marion Jones Went on Oprah Last Week She's probably angling for a book deal. Case Solved: Proof Katie Holmes Cut the NYC Marathon Course A gossip forum spent 30 pages on this and could not resolve it, while other sites like Defamer were still stumped. But we got to the bottom from it in less than 30 posts. *Recap Amy Acuff had good attempts at the American record in the high jump. Italy: Sergiy Lebid Edges by Inches Martin Lel in 10.6km Race in Italy Lel will run the Libson Half then go for glory once again at the London Marathon. Lel won London and NY last year and is currently the top marathoner in the world. Carlsbad: Dirba, Fulton Win Carlsbad Marathon But the story for us is the return of Janko Bensa, a friend of ours from Flagstaff, who had not raced in probably 4 years. *Great Pre-Meet Michigan-Ohio State Dual Meet Article On The History Of The Meet and Why It's Being Brought Back. The author sums things up perfectly with the following line: "In a sport that has become too focused on qualifying times and distances, this weekend's iconic meet, "The Dual," returns track and field to its roots in a fan-friendly setting." Zimbabwe�s Wirimai Juwawo Edges Hendrick Ramaala,To Capture Nedbank Half-Marathon The margin of victory was less than 10 secs. Full results here. British Sprint Hope, Harry Aikines-Aryeetey, Returned To 1st Action After 11 Months Off Due To Injury The former youth superstar is back and Britain is ready to pump him up. His comeback started with a loss as an atrocious start resulted him being 3rd in the final with a 6.72 for 60m. Bekele Looking To Break World 2 Mile Indoor Record On Feb 16 In Birmingham, England The race will be his last before world indoors. Ana Guevera Retires You may ask why a distance site thinks a foreign, female 400 meter runner retiring is big news. Well it is. We've spent a lot of time in Mexico and know Guevera is a big, big deal there. She told the president about her retirement before the press. She is retiring as she says the head of the Mexican athletics, Mariano Lara, is corrupt. She said 6 months ago - either he goes or I do and she's sticking to her word right at the start of an Olympic year. Shockingly the IAAF gave Lara its support. Olympians, National Record Holders Headline This Weekend's USA vs the World Meet a Fresno State The meet kicks offs USATF"s Visa Championship Series for 2008. We like the fact that it will be a scored meet as the death of scored meets in college has led to a decline in popularity of track. More on Paula Running London: Paula Radcliffe and Geti Wami to Square off Again in London London never sits on its laurels or its cash and that is why it is the best marathon in the world. Dave Bedford secured the top marathoner ever in Radcliffe and the World Marathon Majors Champ Wami. *Radcliffe to Use London Marathon as Warm-up for Beijng Dave Bedford, the London director, is expecting that Radcliffe will abandon her front-runing style and practice running tactically in London. Interesting. South African Long Jump Record Holder Has Sent Letter To South African Athletics Asking That She Not Be Selected To the Olympic Games Apparently her training hasn't been perfect but they are 7 months away. "In all the years that I have been involved in athletics I have never received a request from an athlete not to be selected for an Olympic squad." CEO Masback to leave USA Track & Field at End of January The search firm likely won't start interviewing replacements until mid-February. Things kick off in Fresno next week at some new meet. More On Kate O'Neill's Win at Women's US Half Champs in Houston Defending champ Elva Dryer dropped out at mile 9. Paula Radcliffe Running Flora London Marathon Seriously they must have an endless supply of money in London. Houston: US Half Champs: James Carney and Kate O'Neill Win First USA Titles at 2008 Aramco Houston Half-Marathon Another good run for Carney at the 20k/half marathon distance. But you shouldn't be surprised by either winner as Carney has run 27:43 for 10k and Kate O'Neill made the Olympics in 2004. Full Marathon: Dire Tune, 2:24:40, David Cheruyiot Wins for 3rd Time Impressive run for Tune that netted her $35,000. Cheruyiot was upset the rabbits didn't let him get under the 2:10 barrier. Leonard Mucheru Wins Tiberias Marathon in Israel in Record Time for 2nd Time and $40,000 He's the guy who got stripped of his Bahraini citizenship for winning this race last year. Marion Jones Gets 6 Months in Prison Once America's hero, her life is now in shambles. She got a harsh sentence. 6 months, 2 years, supervised probation, and 400 hours of community service. But she did lie to the feds 3 years apart and for the American public for years. "Athletes in society have an elevated status. They entertain. They inspire. And perhaps most importantly, as role models for children around the world." Window Dressing: Baseball, NFL, USOC, USADA Come Together to Give $10 Million to Fight Doping It's sounds impressive until you realize it is $3 million per organization over 4 years. So MLB and NFL, which bring in $6 billion a year, are contributing $750,000 a year which is the price of a 1 player who sits on the bench all year and an amount equal to .0125% of annual revenue (yes 1/100th of 1 percent). A total joke. Meanwhile they take in hundreds of millions of dollars a year in government subsidies and both have antitrust exemptions. American College Action: Sam Bair Comes Up Agonizingly Short of Sub 4 Yet Again We're not sure what the record is of running the most 4:00-4:01 miles without ever going under 4, but Bair has to be close after Saturday's 4:00.16. If he does it, he and his dad will be the first American sub-4 father-son duo. PSU freshman Sam Borchers who ran a 2:21 1k last week, ran 4:01.98. Highlights included the men's 3k that was won by LaSalle's Sean Quigely in7:52 as 5 guys ran 7:57 or better. Providence has two sub-4 guys as Hayden McLaren (3:59.50) dominated the mile. The women's 3k was won in 9:09 by Julie Culley.